Ground turkey recall announced at Publix Super Markets. 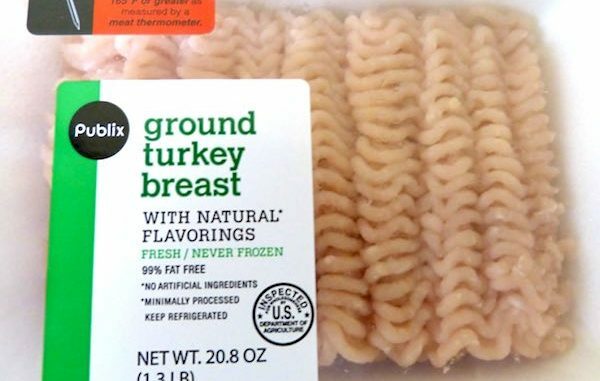 SEBASTIAN – Prestage Foods, Inc. is recalling approximately 38,475 pounds of ground turkey sold at Publix Super Markets because it may contain metal shavings in the packaging. The fresh ground turkey was produced on September 25 and 26, 2017 (with corresponding USE BY of 10/9/17 and 10/10/17) and sold at Publix. 1.3-lb. White Styrofoam trays with clear plastic film covering packages containing ground turkey labeled “Publix ground turkey breast WITH NATURAL FLAVORINGS” with inkjet printing on the side of trays displaying the first 4 digits of 7268 and 7269. 1.3-lb. White Styrofoam trays with clear plastic film covering packages containing ground turkey labeled “Publix ground turkey WITH NATURAL FLAVORINGS” with inkjet labeling on the side of trays displaying the first 4 digits of 7268 and 7269. The Publix Ground Turkey recall products bear the establishment number “P-22000” inside the USDA mark of inspection. These items were shipped to retail distribution centers in Florida and eight other states. Employees at the processing plants found the metal shavings in a ground turkey package on Sept. 27. Customers are urged to toss out the recalled meat packages. So far, the company has received no reports of consumers finding the shavings.